Update: The Diablo Twitter account has confirmed this, so it’s really real now! While there’s no specific launch date, the game will be released in 2018. In a post that has since been deleted, Forbes let slip that the Diablo 3 console port we’ve been expecting is finally happening. 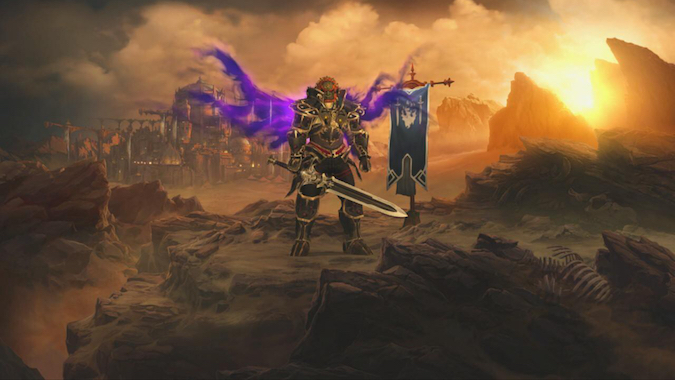 Yes, Diablo 3 on the Switch has been confirmed — apparently entitled “The Eternal Collection“! We can expect it to arrive later this year for the price of $59.99 USD. With this port, Diablo will finally be on all major home consoles. This is also the first time in over 15 years that Blizzard will have a game on any Nintendo console. The last instance of the two companies joining forces was with versions of Rock n’ Roll Racing, Blackthorn, and The Lost Vikings for the Game Boy Advance. The Eternal Collection includes not only the Reaper of Souls expansion, but also the Rise of the Necromancer content, as well as some additional content exclusive to the Nintendo Switch. You’ll be able to collect a “Legend of Ganondorf” set of armor, a Tri-Force picture frame, Echoes of the Mask cosmetic wings, and a Cucco companion pet. Anyone who’s played a Zelda game know those things are no joke — Malthael isn’t going to know what hit him. This does make me wonder if we’re going to see Diablo content make its way into other Nintendo games. I’d love to take to the streets in Mario Kart with a Barbarian. Couch co-op with up to four players on the same Switch console. Playing with up to four different Switch’s connected together wirelessly, without the need for an internet connection. Playing over the internet with friends all around the globe. Assuming it comes out before BlizzCon, I expect that there’ll be a lot of people playing together while waiting in lines for panels — of course, it could always be a post-Con release. The usual cloud saving for Diablo will remain in place, so you don’t need to worry about having your personal Switch console to access your characters. We’d recently heard that there was big news coming from the Diablo universe, and this is probably just the start. BlizzCon is only 79 days away, so cross your fingers that we get even more exciting news about continuing our adventures in Sanctuary!